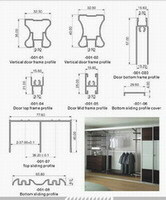 door including sliding roller fittings, hinge, handle, and other accessories. our suspending and sliding door ,glass hanging sliding door ,frameless sliding door ,wardrobe sliding door , folding door and relevant hardware fittings in excellent quality ,fashion ,durability ,easy installation . Our sliding rollers are well made of durable and noiseless nylon & improved nylon imported from Germany ,with special polishing process ,the rollers are smooth , without mould trace ,no sharp edge ,no leap , with fashionable designs ,our sliding roller fittings make your home decoration more perfect .